Last week when my mother-in-law was in town we went to Bergdorf’s to see the windows. 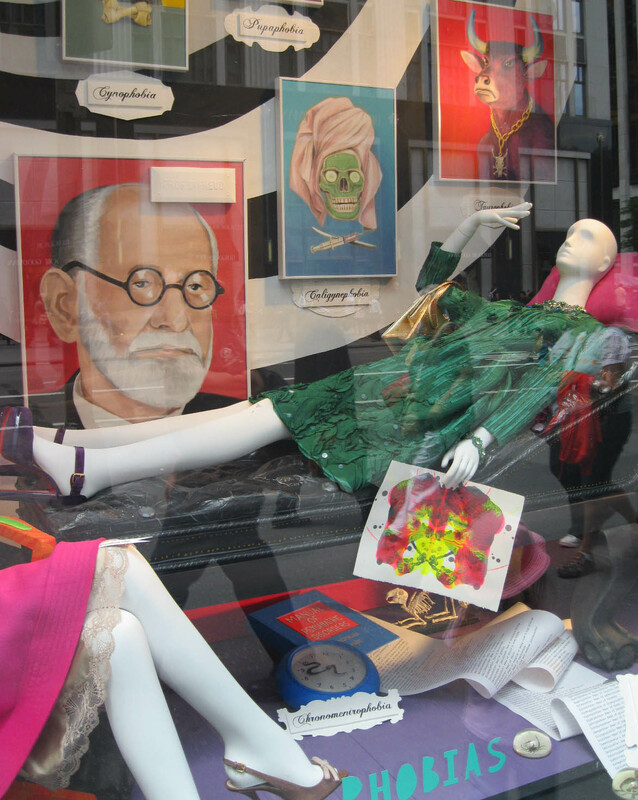 The main windows on Fifth Avenue featured DayGlo colors in both the clothes and the artwork and an extensive list of phobias. I was most in love with the hot pink suit, especially with the champagne-colored lace slip peeking out (look for the “Freudian slip”). 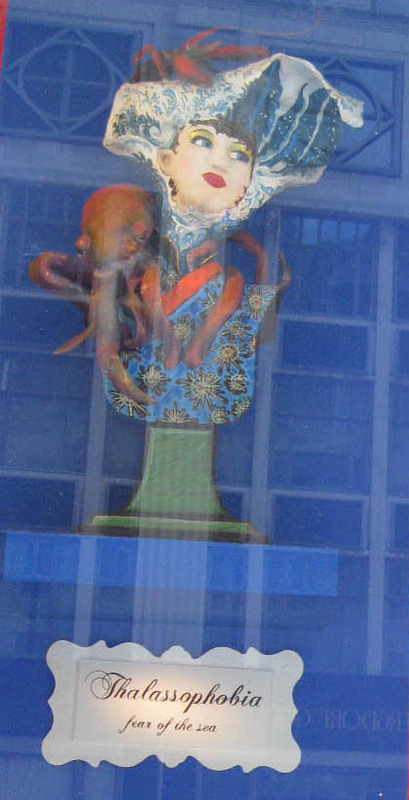 A Bergdorf window on 57th Street. I loved all these doors. At the top of the photo the reflection of the building across the street has been captured in the glare, adding windows to this image. A happy mistake! The patient (note the Rorschach test in hand and Dr. Freud’s portrait on the wall). Your intrepid photographer caught in the window’s glare, on the left. Thalassophobia, Fear of the Sea. I do feel like I have one phobia, astraphobia, the fear of thunder and lightning. It really scares me to see lightning, even from far away, and sometimes creeps me out in pictures too, if the photo shows a direct strike. Shudder, shudder. Any phobias you care to share? 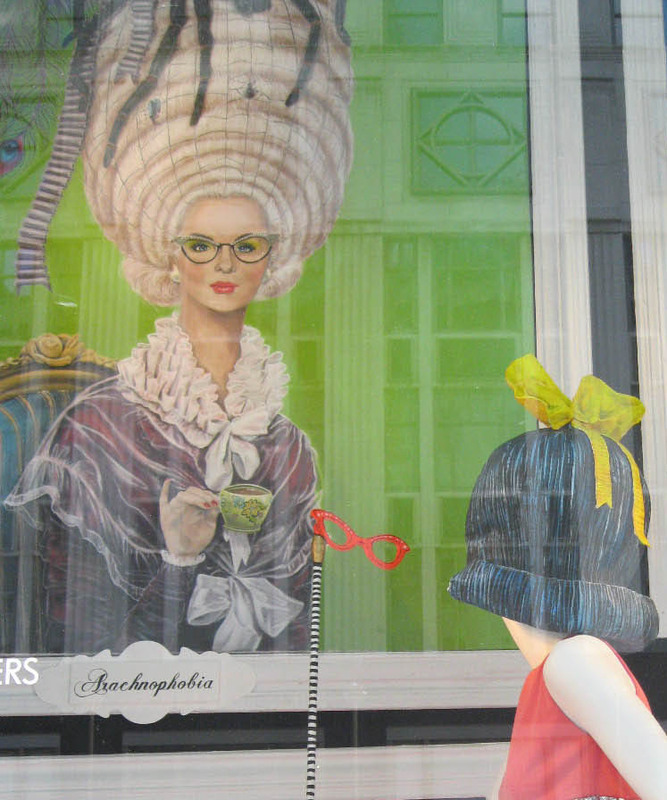 What great window displays. That is what I miss about living in San Francisco - walking around Union Square and window shopping. 3) flying - I still fly willingly, I just need copious amounts of wine and my husbands arm to dig my nails into. 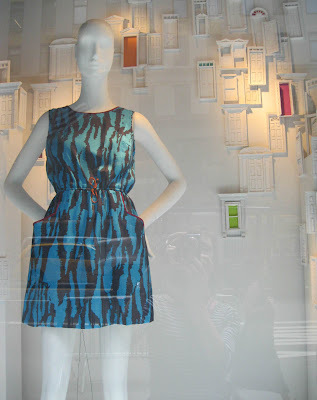 I love cerebral fashion displays. This is fantastic! The Freudian slip...brilliant. Thanks for sharing. I have no phobias. Although I feel a bit claustrophobic when I'm surrounded by water. I don't think a cruise is in my future. 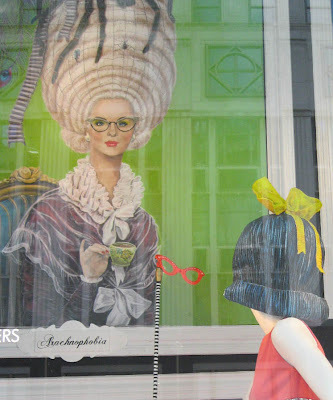 I adore the window display!!! So fun!!! I thought the arachnophobia was funny. 2.I have a weird fear of dead bodies. My dad is a pastor and he has to preach funerals often. Ive been to quite my fair share and I can honestly say that there has never been a time where being next to the coffin-even that words sends a chill down my spine-I was not disturbed in my being. It really just creeps me out so bad. I dont even know how to explain it. I think its because theyre dead but theyre still right there and theyre supposed to be alive in my mind. It makes me sad that theyre missing out on life. I also have separation anxiety so maybe thats part of it. 3. Deep water terrifies me. I love sailing though and water sports. Which is funny. But I never know what is under me and Ive had a few instances of falling off the back of a jet ski and being in deep water. I cant stand it. Im scared a shark is going to eat me or something is going to get me lol. Though i love shark movies. Haha. What a contradiction. No phobias, but I learn the name of many thanks to you. Love the pics so much. Loved the window shots...NYC is one place where window shopping is almost as much fun as going in the store!! I have claustrophobia really bad. I cannot lie in the middle of a bed between two people...I have to always have an out! It got worse after menopause as well! I responded to you on my blog, but do not know if you saw it...my daughter's wedding dress was a new affordable line of Vera Wang dresses for David's Bridal...called the WHITE collection. I'm not aware of any phobias. I really like the visual puns in these windows. Oh, fraid of heights...and like Pam, worse after menopause--whats up with that???? 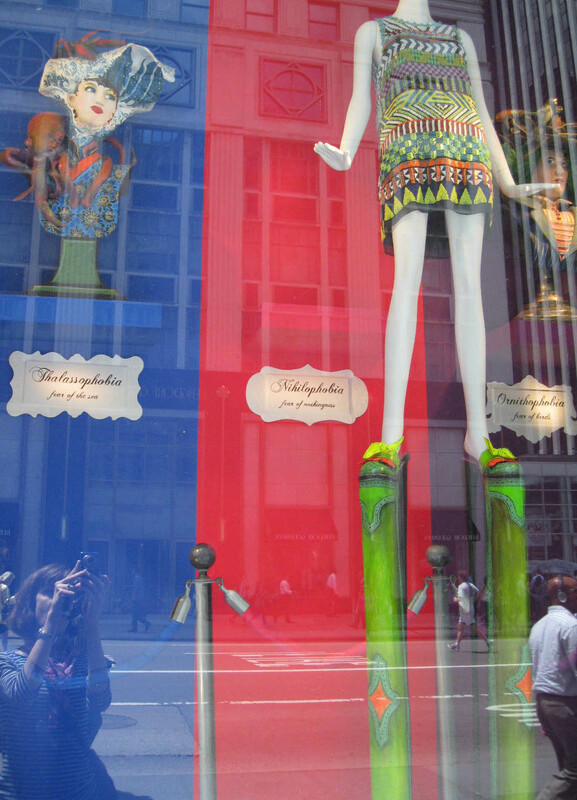 Hi Adrienne, I'm really enjoying going to see the Bergdorf windows every other month. So stand by for more pictures! As for phobias, ooh yeah, claustrophobia, I can get like that in elevators, I think I've been stuck in elevators one too many times. Spiders kind of freak me out but I'm not afraid to get a shoe and whack 'em! And flying, I've never not gotten on a plane, but if I haven't flown in awhile I do get kind of nervous at takeoff. Hi Vahni, I have to say I'm finding it fascinating to read everyone's phobias/things that make them slightly nervous. Claustrophobic when surrounded by water, that's interesting. I'm not a good sailor myself, creeped out by thoughts of sharks or a giant squid, and I get seasick too, so I don't think a cruise is in my future either. 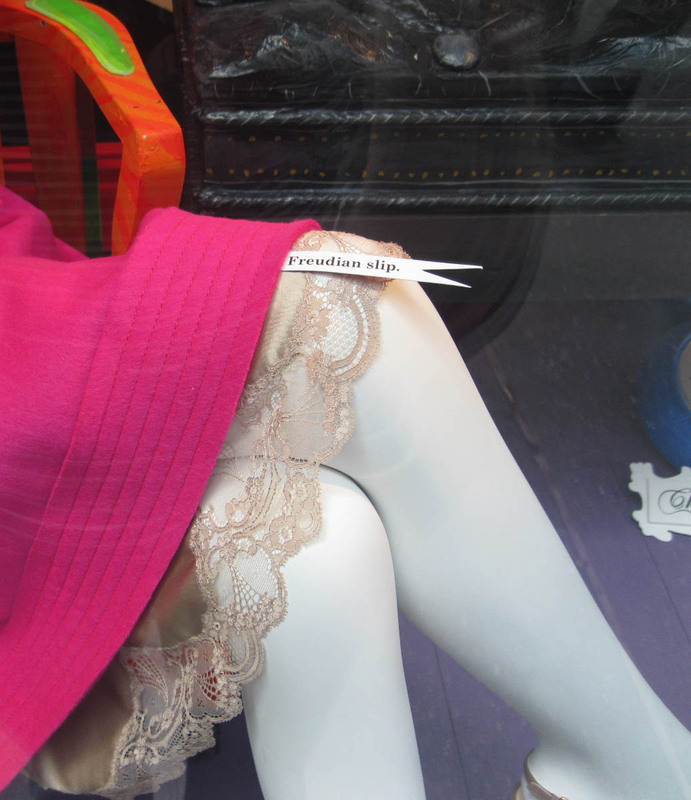 Hi Fashion Eggplant, thanks for stopping by! 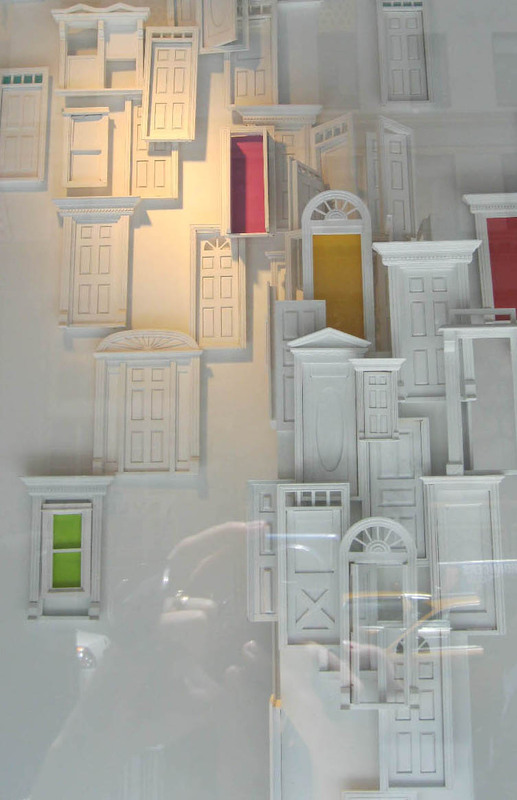 Look for more windows soon, I hope to head back into the city in the next week or two for more 57th Street displays. Hi Madi, thanks for stopping by! I'm so with you on the deep water thing, sharks and giant squid are what I always imagine are just below the surface. And yet when I go to the NY Aquarium on Coney Island with my kids, I could watch the sharks all day, they are so fascinating/creepy with their rows of teeth, all on display! Hi Sacramento, I'm so not surprised to learn you have no phobias. You always seem fearless to me. I'm glad to share Fifth Avenue with you. You share Spain (and Berlin) with me! Hi Pam, I loved your daughter's wedding dress and I'm happy to know Vera Wang is producing a more affordable line, I can just imagine how much one of her gowns would cost at her showroom in the city. I'm a bit claustrophobic myself, especially in a crowded elevator. I'm going to make the windows a regular feature, I think. I love it when I see windows in places I can't get to, like Paris, and shooting the windows forces me to get out of the house and get into the city! Hi Terri, a ha! You, like Sacramento, have no phobias. You two do seem fearless to me. Hi Paula, I'm with you, the doors were so gorgeous, each one different, with unique woodwork. 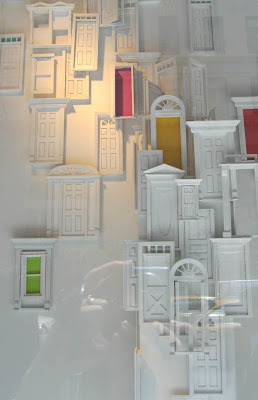 I find myself becoming more interested in these Bergdorf windows, because you are right, they must have a big budget for them and I'm curious about the people they hire to do the windows and how long it takes them to design and then assemble them. I think I just gave myself an assignment to find out. I believe there is a book on the Bergdorf windows but will have to investigate further. I will report back here! Hi Desiree! So glad you could stop by, I'm coming to your blog so I can be inspired to put on a dress. I don't have the heights fear, I love going to the top of buildings in NYC and then heading straight to a window/balcony to look down. I'm happy to share the windows with everybody and hope to do more soon. SoHo has nice windows too, especially Prada and Louis Vuitton.